The tour was warmly received by the Australian trade union movement, which supported and hosted several of the events. A FIVE-CITY national speaking tour of Australia by Sinn Féin Vice-President Mary Lou McDonald TD and Mid-Ulster MP Francie Molloy to promote the Uniting Ireland campaign included public meetings attracting more than a thousand people. 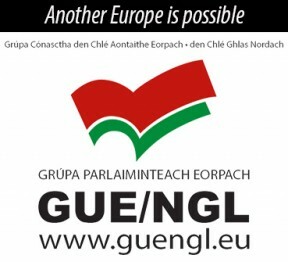 The coast-to-coast tour, from 30 August to 9 September, included events in Perth, Sydney, Canberra, Melbourne and Brisbane to meet with the Irish community, labour movement activists and leaders, and academics. Mary Lou and Francie also met with dozens of Australian political representatives from the Australian Labour Party, the Greens, the Nationals, and the Liberal Party from across the country. The Sinn Féin representatives outlined the role of the Diaspora and the Australian labour movement and political forces in supporting the international campaign for a referendum on Irish reunification. The Sinn Féin representatives also raised with Australian political representatives issues faced by the local Irish emigrant community, including the campaign against unaffordable school fees for the children of skilled migrants working in Australia on the 457 visa (which affects Western Australia, New South Wales and the Australian Capital Territory). Another goal of the tour was to raise awareness among Irish workers in Australia of their workplace rights and entitlements. During the tour, the Sinn Féin representatives spoke with several Australian MPs and senators in the state and federal parliaments, including federal Shadow Minister for Workplace Relations Brendan O’Connor and Education Minister in the Australian Capital Territory Government Joy Burch. A political briefing was held in the federal, New South Wales and Victorian parliaments. They met with New South Wales Parliament Labour Party leader John Robertson as well as Shadow Attorney General and long-time Irish solidarity supporter Paul Lynch and several MPs. In Western Australia, they met with Parliamentary Secretary Vince Catania, while in Victoria they met with a group of MPs, including the President of the state Legislative Council, Bruce Atkinson, at a briefing hosted by MP Bronwyn Halfpenny. The federal parliamentary briefing was hosted by Senator Gavin Marshall. Altogether they met with 38 MPs and senators across Australia, many of whom had already signed up to the ‘Australian Irish Unity Motion’ or did so during the tour. Other highlights of the speaking tour included meeting with Aboriginal activists in Perth and Sydney; visiting the Global Irish Studies Centre at the University of New South Wales; a meeting of women trade unionists with Mary Lou McDonald in Sydney; Francie Molloy meeting with the Australian Tamil Congress; and Mary Lou addressing a rally against austerity in Perth. Mary Lou and Francie met with Australian Congress of Trade Unions President Ged Kearney in Melbourne, as well as Construction, Forestry, Mining and Energy Union national leaders Dave Noonan and Tony Maher, and Maritime Union of Australia Assistant National Secretary Mick Doleman at a union-hosted event in Sydney on 2 September. They also met with several state leaders of the Construction, Forestry, Mining and Energy Union, including Brian Parker and Mick Buchan, as well as leaders and activists from many other unions throughout the tour. As well as building links of solidarity between progressive forces in Ireland and Australia with the trade unionists, the Sinn Féin representatives also discussed developing joint efforts to combat the exploitation of Irish workers in Australia on temporary visas and to promote union membership among Irish workers as part of this. 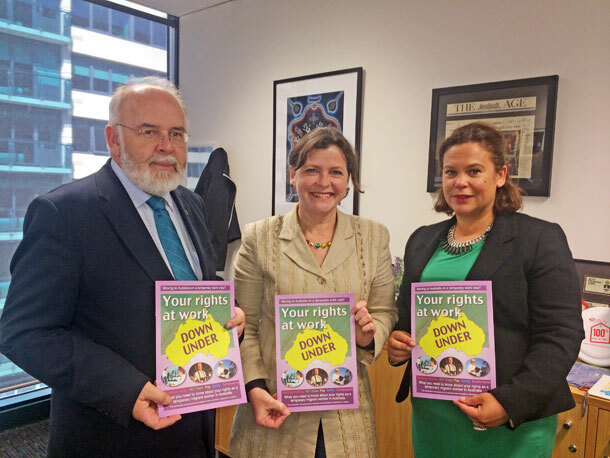 Following the speaking tour of Australia by Pearse Doherty TD in 2012, Cairde Sinn Féin worked with Australian and Irish unions to produce the Know Your Rights at Work Down Under pamphlet which Mary Lou and Francie continued to promote among Irish workers during this tour. For full details of the tour, and to download the Know Your Rights at Work Down Under pamphlet, visit cairdesinnfein.com. 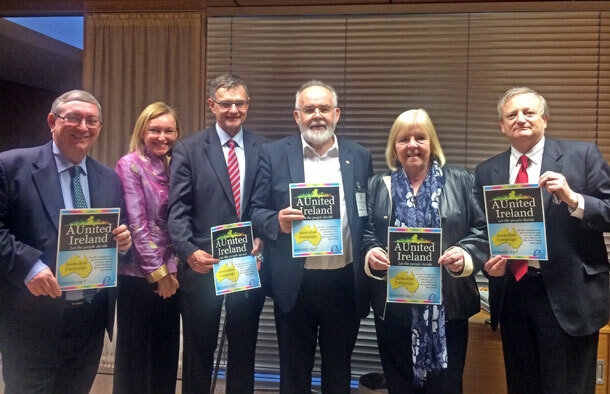 For a full list of signatories to the Australian Irish Unity Motion, visit irishunity.org.